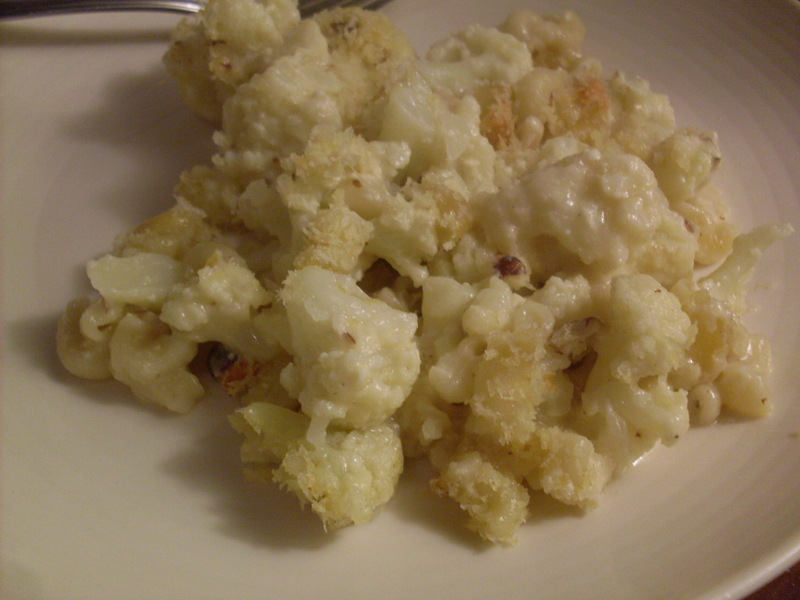 Cheese is also quite excellent with cauliflower, which you likely know by now. And if you throw in a bit of pasta, it’s a meal! Some nuts for crunch, and you have a 9″x13″ masterpiece, which will feed a family, or if there’s just the two of you, like there’s just the two of us, you’ll have dinner and lunch the next day, and possibly the day after that. I’m participating in Midnight Maniac’s ninth Meatless Monday blog carnival today, so after you’re done learning new bad habits over here (Meatless Monday is about health? I’m doing it wrong. ), hop on over there and say hello, and check out some of the other bloggers’ fantastic Meatless Monday recipes. Preheat your oven to 375°F. 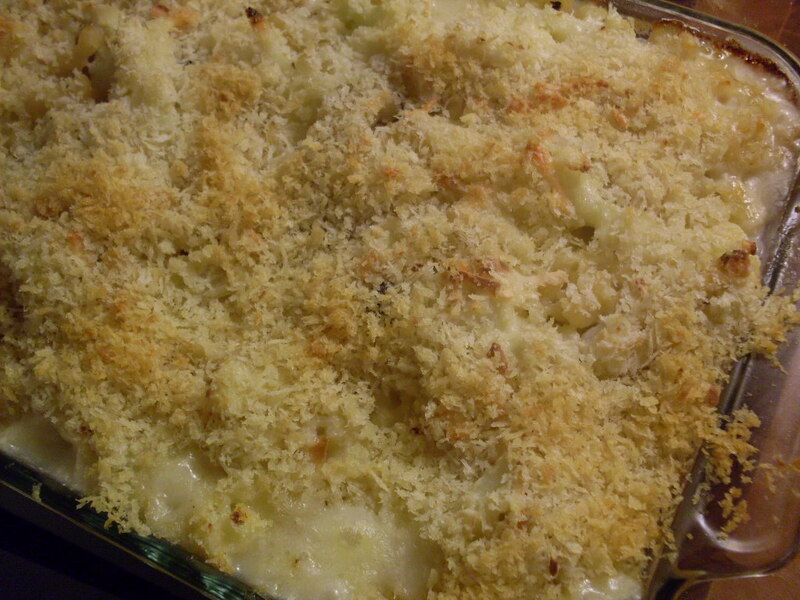 Grease a 9″x13″ baking dish, and set it aside. Place cauliflower in a large pot, fill to just over the top of the cauliflower with salted water, and bring to a boil. Boil for five minutes, drain, then set aside. Meanwhile, bring a pot filled with the macaroni to a boil, and cook until almost al dente, five or six minutes. Drain and pour the noodles in with the cauliflower. In a medium saucepan over medium-high heat, melt butter with two of the minced garlic cloves. When it’s bubbling, add the flour and mustard, and stir until a paste forms. Add milk, and whisk to combine. Turn heat down to medium. Add pepper and cayenne pepper, and simmer until thickened, stirring occasionally, about five minutes. Add most of the cheese, save for a handful. Taste, and add salt as needed. Stir and pour over top macaroni and cauliflower. 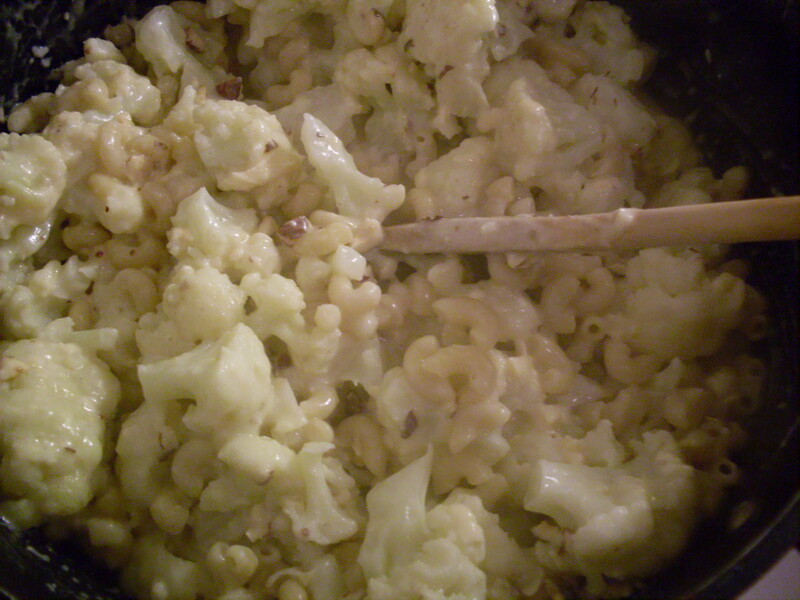 Add hazelnuts, and stir mixture to coat cauliflower and pasta in sauce. Pour into prepared pan. Sprinkle with remaining cheese. Meanwhile, over medium-high heat, melt one tablespoon of butter with the last clove of garlic. When the butter has foamed, add bread crumbs, and stir to coat. Cook until butter is absorbed and pan looks dry, about two minutes. Pour over top of macaroni mixture. Bake for 30 to 35 minutes, until sauce is bubbly and crumbs have turned golden. Serve to adulation. This is creamy, cheesy, and crunchy, thanks to the nuts and the crumb topping. It’s texturally pleasing, and it’s hard to go wrong with that much cheese. Maybe serve with something green or otherwise colourful, because it’s a rather neutral-coloured dish. Fortunately, the taste is much brighter. Serve with beer or ice cold milk. Next > Shrimp and grits. You proooooooomise the cauliflower won’t ruin it ;)? oh cauliflower! I love feeding it to my kids,because it’s not green and they’ll eat it. When I make mashed cauliflower (instead of potatoes) they call it Spudge. When I’ve made it with cheese they called it “Hey, this isn’t Mac and cheese!” but ate it anyway. I love the nuts idea, because it really is kinda lacking in the texture department. I’m going to try it…but with almonds,because the only hazelnuts we can get here are still in the shell and I am LAZY. Oh I think I might make this tonight, thanks for the recipe! What kind of breadcrumbs? It looks like you’re using panko here, is that right? Emily – I just made this (well sort of – I didn’t have hazelnuts, so I used pine nuts and I didn’t have bread crumbs or the desire to make any, so I used parmesan croutons mixed with rippled chips and I didn’t have dijon, so used plain mustard) but it still turned out so good! I’m glad you had a cauliflower recipe in your archives!